The arrival of iPlayer on Freesat HD is a milestone in the emergence of hybrid TV, but it's also highlighted the fact that very few homes are designed with broadband connections anywhere near the TV. Technisat sells a Wi-Fi adapter for its Freesat box, but most Freesat HD boxes only provide an Ethernet socket, and a wired connection is still recommended for reliable streaming. Short of tacking Ethernet cable around your house, the best solution is Powerline networking, which piggybacks a broadband network over your domestic mains power cables. Ethernet cables plug into an adapter at the socket, and the state of the art can exceed 100Mbit/s around a typical home. Freesat has certified Devolo's dLAN 200 AVpass kit for streaming iPlayer and other forthcoming services. 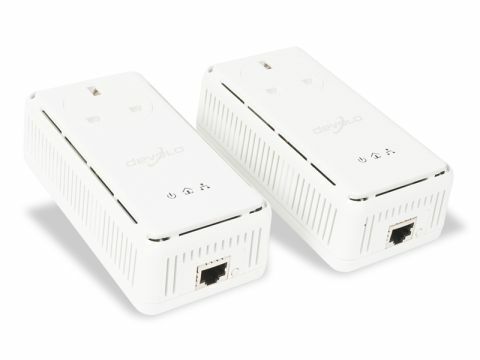 It's a starter kit of two HomePlug AV adapters, which should work with anything else carrying the HomePlug AV badge, which gives a theoretical top speed of 200Mbit/s. The AVpass adapters include a pass-through three-pin mains socket so you don't lose a socket to your network; connect this direct to the wall and add any multi-socket strip adapters on top. It's rated to 16A, and ours coped with the demands of a sizeable AV stack. Three indicators tell you if it's powered up, connected to an active Ethernet cable, and the speed available. The Ethernet cable plugs in at the bottom end, and this might prove a problem if your sockets are near the ground, needing at least 10cm (4in) below the socket to turn a right angle. A small button next to the Ethernet port pairs up the adapters and encrypts your data; extra software lets you change the default password easily and update the device firmware. You can add several adapters, but they all share the available capacity. We tested our pair with iPlayer on a Humax Foxsat-HDR, a Slingbox and the Iomega Screenplay Director opposite, streaming HD video with no difficulty as though connected with regular Ethernet. There's even an automatic power-saving mode when your device is in standby. At £120 it's an expensive addition just to get iPlayer, but hybrid TV is going to become the norm so this is one investment that will pay off.